UK-based artist Mister Sam has once again created hybrids of man and machine with his custom artwork on the new limited edition Clockwork Zombie Graphic Series guitars for ESP's LTD. The EC-CZII, EX-CZII, and Viper-CZII combine skeletal remains with metal cogs, flywheels, and gears on these sinister instruments. 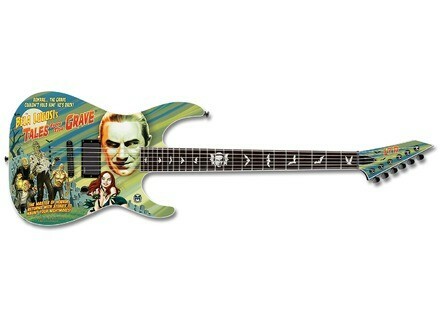 No technical info, or pricing/availability info, but you can check out ESP at www.espguitars.com. ESP LTD Hex-7 Nergal Signature Another model from ESP: The Nergal LTD Hex-7 Signature. ESP LTD FL-600 Frédéric LeClercq Signature Among its new releases, ESP is introducing the Fred LeClercq LTD FL-600 Signature model bass. [Musikmesse] ESP LTD Okkultist & Shadow ESP has added a couple of new signature products to its LTD line, the Okkultist and the Shadow from the guitarists of Dimmu Borgir.